Contrary to widespread belief, the use of dangerous substances is not decreasing in the EU, and the need to manage the risks they pose is as pressing as ever. Some of the substances that workers are most commonly exposed to include carcinogens. The European Commission has recently proposed to limit workers' exposure to five cancer-causing chemicals, in addition to the 21 substances that have already been limited or proposed to be limited. Marianne Thyssen, European Commissioner for Employment, Social Affairs, Skills and Labour Mobility, spoke at a press conference in Brussels to mark the campaign launch: "We will continue to raise awareness and take action to limit workers' exposure to cancer-causing chemicals. This is a key priority for the European Commission, not least because the European Pillar of Social Rights entitles workers to a high level of protection of their safety and health at work. EU-OSHA's campaigns are leading the way in reaching workplaces across Europe and help organisations adopt effective approaches to occupational safety and health management with the necessary tools." 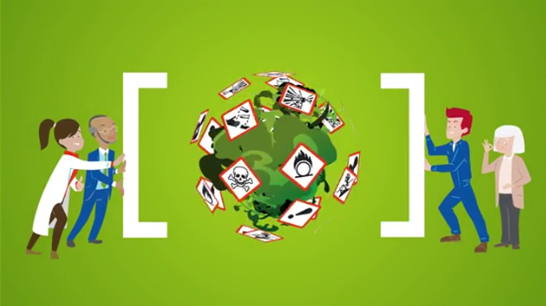 The new campaign aims to promote techniques for the proper management of dangerous substances in the workplace, such as risk assessment, elimination and substitution, by disseminating practical tools and case studies. It also focuses on groups of workers who are at particular risk. Dr Christa Sedlatschek, EU-OSHA's Director, states that: "Many workers are unaware that not only manufactured chemical products that are labelled with risk and safety information can cause harm. Other commonly used substances across all sectors – from working with flour in bakeries to silica dust on construction sites – can be hazardous if their use is not managed effectively. Therefore, our campaign raises awareness of all types of dangerous substances, not just the obvious ones, and emphasises the importance of risk assessment in all sectors as the first step towards prevention." The campaign brings together a wide range of partners, including EU-OSHA's network of national focal points, official campaign partners, media partners and the Enterprise Europe Network, which help to spread the campaign's messages to micro, small and medium-sized enterprises. The campaign also has the backing of the European institutions and their networks, in particular the Bulgarian Presidency of the Council of the EU. Lazar Lazarov, Bulgarian Deputy Minister of Labour and Social Policy, commented, "The latest Healthy Workplaces Campaign has an important message. While the legislation may be in place, workers and employers across the EU need to be aware of the rules and regulations and how best to comply with them. Otherwise, the risks posed by exposure to dangerous substances will not be managed properly. We look forward to working with EU‑OSHA and the campaign partners over the coming years." Ideas and interventions that make an impact at workplace level are shared in particular through the Healthy Workplaces Good Practice Awards. Furthermore, a range of materials have been developed and made available through a multilingual website to support the campaign. An e-tool to effectively manage dangerous substances in the workplace is available in English and soon will be accessible in three country versions (Austria, Estonia and Romania). Furthermore, a database has been created of almost 700 practical tools and guidance documents from 11 Member States, and case studies, infographics and animated short films starring the character Napo can also be found on the campaign website. In addition, EU-OSHA is a partner of the Roadmap on Carcinogens. This action scheme aims to raise awareness of carcinogens in the workplace and the associated limit values and legislation, and to provide practical information on risk assessment and good practice examples for eliminating or managing risks. Protecting the health and safety of EU workers is a top priority for this Commission. The EU has been a frontrunner in high standards of workers' protection. To keep this up, the Commission has already presented 3 revisions of the Carcinogens and Mutagens Directive since the start of this mandate. By introducing new or stricter exposure values for 20 cancer-causing chemicals at the work place, more than 100,000 lives will be saved in the next 50 years. Furthermore, in January 2017 the Commission launched a two-year programme for updating EU health and safety legislation. The aim of this programme is to ensure the EU's health and safety framework is future-proof, to create a level-playing field across the EU, and to improve compliance and enforcement on the ground. To raise awareness of the relevance and importance of managing dangerous substances in Europe's workplaces. To promote risk assessment, elimination and substitution by providing practical tools and examples of good practice. To raise awareness of the risks of exposure to carcinogens by supporting the exchange of good practices. To target specific groups of workers who are at greater risk, by providing tailored facts and figures and guidance on good practice. To increase awareness of developments in policy and legislation, by providing a plain language overview of the existing legislation and guidance. Following the launch on 24 April 2018, campaign highlights include the European Weeks for Safety and Health at Work (October 2018 and 2019) and the Good Practice Exchange Event (early in 2019). The campaign concludes with the Good Practice Awards Ceremony and Healthy Workplaces Summit (both in November 2019). Hosted by EU-OSHA in Bilbao, these events offer a chance for those who have taken part to celebrate the campaign's successes and reflect on what has been learned. The European Agency for Safety and Health at Work (EU-OSHA) contributes to making Europe a safer, healthier and more productive place to work. The Agency researches, develops, and distributes reliable, balanced, and impartial safety and health information and organises pan-European awareness raising campaigns. Set up by the European Union in 1994 and based in Bilbao, Spain, the Agency brings together representatives from the European Commission, Member State governments, employers' and workers' organisations, as well as leading experts in each of the EU Member States and beyond. Follow EU-OSHA on Facebook, Twitter, LinkedIn, YouTube or subscribe to its monthly newsletter OSHmail. You can also register for regular news and information from EU-OSHA via RSS feeds.